Very interesting and delicious challenge. I just wanted to keep very simple design and simple filling, as this month we are loaded with too many sweets. 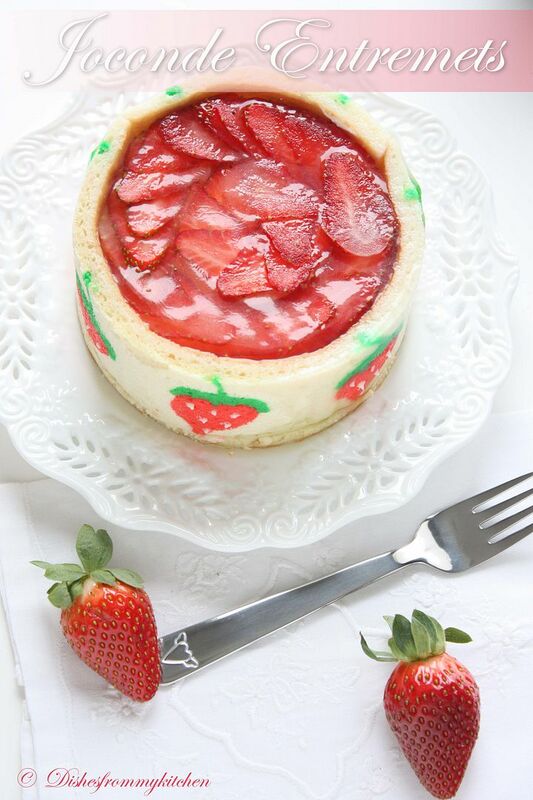 So I filled with strawberry Bavarian cream which is our favorite. Hope you all enjoy my Joconde Entremets. 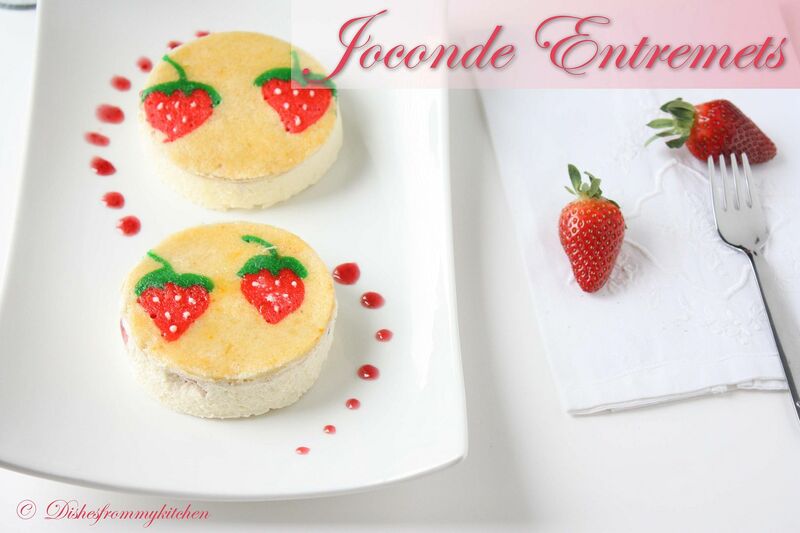 Ok...What is Joconde imprime/entremets ? - Joconde imprime /entremets. A joconde imprime (French Baking term) is a decorative design baked into a light sponge cake providing an elegant finish to desserts/torts/entremets/ formed in ring molds. A joconde batter is used because it bakes into a moist, flexible cake. The cake batter may be tinted or marbleized for a further decorative effect. 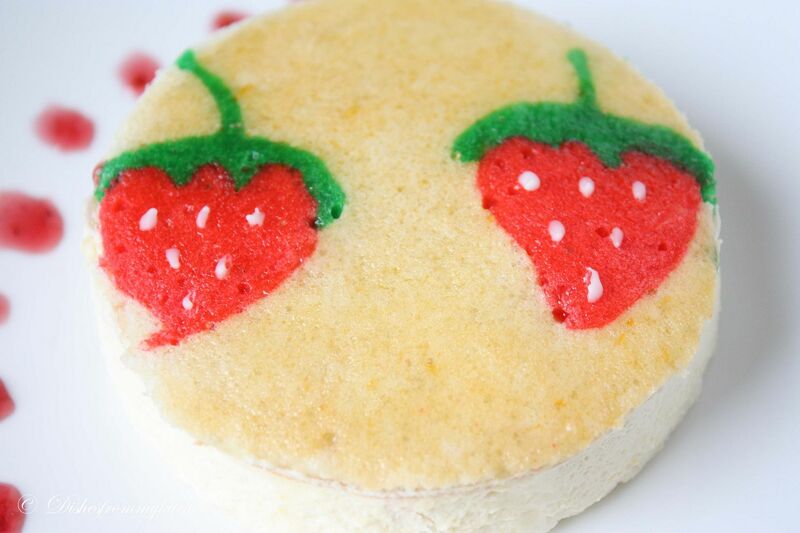 This Joconde/spongecake requires attentive baking so that it remains flexible to easily conform to the molds. If under baked it will stick to the baking mat. It over baked it will dry out and crack. Once cooled, the sponge may be cut into strips to line any shape ring mold. Entremets (French baking term)- an ornate dessert with many different layers of cake and pastry creams in a mold, usually served cold. Think Trifle in a mold vs. a glass bowl. I just halved this recipe. 4. Fold in one third reserved whipped egg whites to almond mixture to lighten the batter. 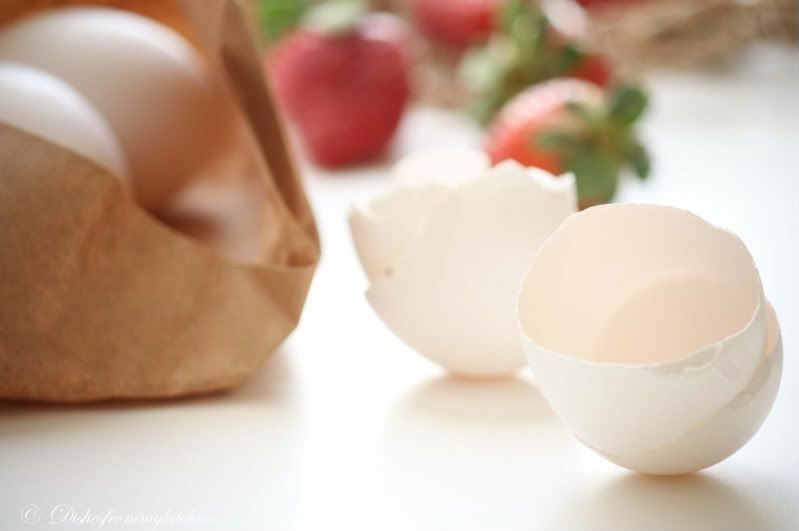 Fold in remaining whipped egg whites. Do not over mix. 6. Reserve batter to be used later. I just quatered this recipe and made 2 different colors green and Red. 1. Spread a thin even layer of décor paste approximately 1/4 inch (5 millimeter) thick onto silicone baking mat with a spatula, or flat knife. Place mat on an upside down baking sheet. The upside down sheet makes spreading easier with no lip from the pan. 2. Pattern the décor paste – Here is where you can be creative. Make horizontal /vertical lines (you can use a knife, spatula, cake/pastry comb). Squiggles with your fingers, zig zags, wood grains. Be creative whatever you have at home to make a design can be used. OR use a piping bag. Pipe letters, or polka dots, or a piped design. If you do not have a piping bag. Fill a ziplock bag and snip off corner for a homemade version of one. 4. Remove from freezer. Quickly pour the Joconde batter over the design. Spread evenly to completely cover the pattern of the Décor paste. 5. Bake at 475ºF /250ºC until the joconde bounces back when slightly pressed, approx. 15 minutes. You can bake it as is on the upside down pan. Yes, it is a very quick bake, so watch carefully. You can use any type of mold. 1. Start with a large piece of parchment paper laid on a very flat baking sheet. Then a large piece of cling wrap over the parchment paper. Place a spring form pan ring, with the base removed, over the cling wrap and pull the cling wrap tightly up on the outside of the mold. Line the inside of the ring with a curled piece of parchment paper overlapping top edge by ½ inch. CUT the parchment paper to the TOP OF THE MOLD. It will be easier to smooth the top of the cake. 2. A biscuit cutter/ cookie cutter- using cling wrap pulled tightly as the base and the cling covering the outside of the mold, placed on a parchment lined very flat baking sheet. Line the inside with a curled piece of parchment paper overlapping. 3. Cut PVC pipe from your local hardware store. Very cheap! These can be cut into any height you wish to make a mold. 2 to 3 inches is good. My store will cut them for me, ask an employee at your store. You can get several for matching individual desserts. Cling wrap and parchment line, as outlined above. 4. Glass Trifle bowl. You will not have a free standing dessert, but you will have a nice pattern to see your joconde for this layered dessert. 5. The mold is done, and ready to fill. *Note: If not ready to use. Lay cake kept whole or already cut into strips, on a flat surface, wrap in parchment and several layers of cling wrap and freeze. Mousses, pastry creams, Bavarian creams, cheesecakes, puddings, curds, jams, cookie bases, more cake (bake off the remaining sponge and cut to layer inside), nuts, Dacquoise, fresh fruit, chocolates, gelee. How do you have so much time and patience? superb and creative. All the best. Wow,looks so pretty! Great effort and the outcome is really fantastic Pavi! I just LOVE your final entremet the pattern design of strawberries is so cute and elegant and the filling is such a winner. Wonderful work on this challenge. Cheers from Audax from Sydney Australia. Amazing snaps. The strawberry pattern is so cute..
Im in love with your design they look absloutley super beautiful. Absolutely stunning Pavithra...Love yr strawberry work..
Omg, PAvi u rock dear, beautiful patterns and delicious joconde, cant take my eyes from the clicks..
Beatiful :)...Just one word EXCELLENT the way u have dont it !!! I love your entremets and all the variations you created! The design is so cute and your sponge is so white! Job very well done! Congratulations! Love the strawberry pattern. Filling and the texture of is just the right. Gorgeous looking clicks! Slurp soo tempting and drool-worthy dish..
wow, this is awesome..how i wish i could eat it..looks superb.. I love this! Your design is beautiful, and your filling sounds so perfect! Your hard work is amazing and inspiring. Thank you so much for sharing your creativity! 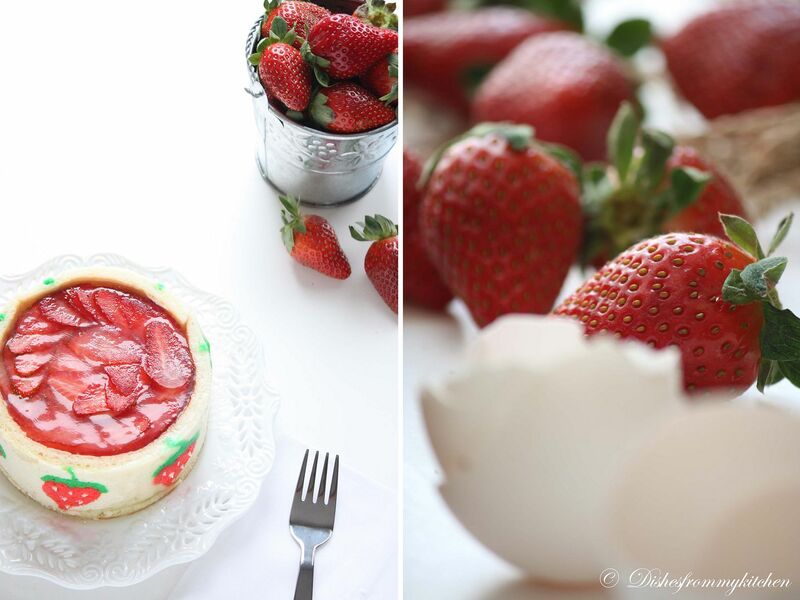 Strawberry bavarian cream sounds AMAZING, and your finished dessert is absolutely beautiful - the strawberries are both cute and fancy at the same time! Really awesome job. Oh, and your photographs are beautiful, also!! Well done with the challenge P...love the patterned joconde. Came out beautifully. I did a Strawberry Bavarian Mousse for mine, and an Espresso Panna Cotta for the other. OMG !! looks gorgeous..Excellent job!! thats one gorgeous looking cake....soo pretty must have tasted great!...shows all the hard work u put in! Pavithra - I'm standing up and saluting you! You are an epitome of patience. Love this post and the pictures - this indeed is a tough one and you came out with absolutely brilliant strawberry colors! Congrats! OMG great work, done very beautifully as always Pavithra and looks luscious! WOW! What a sponge! You have created a masterpiece. You Scored high!! looks fabulous..
Beautiful, you did wonderful challenge. Absolutely gorgeous cake looks superb. AMAZING!!!! I remember seeing this in the forums and being bowled over. Just so pretty and clever. Beautifully plated, too. Absolutely gorgeous, divine, amazing, and awesome post!!! Your cakes are so cute and look delicious! Oh my gosh!!! You are phenomenal! I cannot believe you piped out strawberries!!! Simply perfect! I bet it was a real show stopper!! Beautiful, beautiful job! Wow looks yummy and beautiful cake..Just amazing dear. Luks gr8!i know it's not at all easy work...Love the designs! I've learnt something new. Thank you! I love the design you used. Cute strawberries! Excellent job! 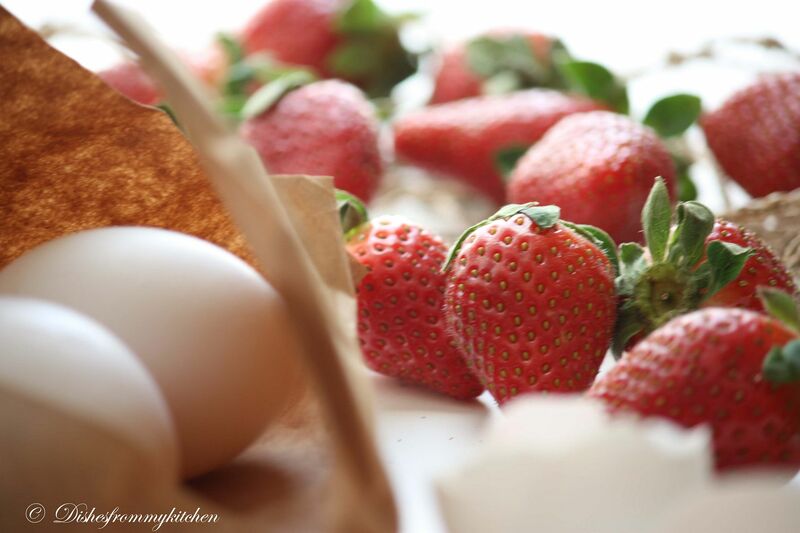 Your strawberries look great, especially for being small and detailed! 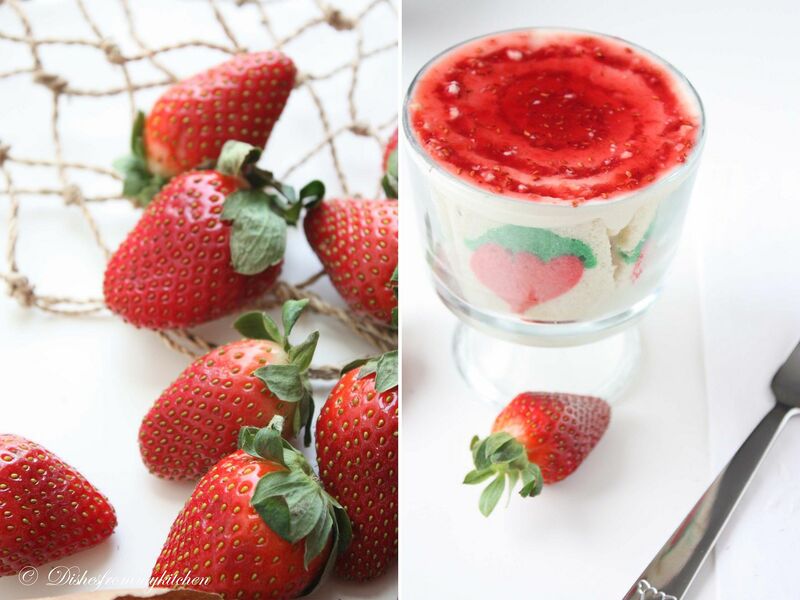 And I love the look of the strawberries on the top of the dessert. Nice job on the challenge! This is simply stunning Pavithra! You guys are really daring bakers! You have done a fabulous job! D-R-O-O-L, Oh my, if only I can get it from my monitor and eat it, I'll absolutely get one! I bet it taste heavenly, plus the cute presentation makes it even more yummy! OMG SPEECHLESS NO WORDS TO DESCRIBE. Real treat to eyes, fabulous and beautifully done..
Oh God.. the colours and the pictures are just tempting.. lovely cake..
omg...how did you do that! This has got to be the best joconde I have ever seen. The strawberry pattern is so pretty. 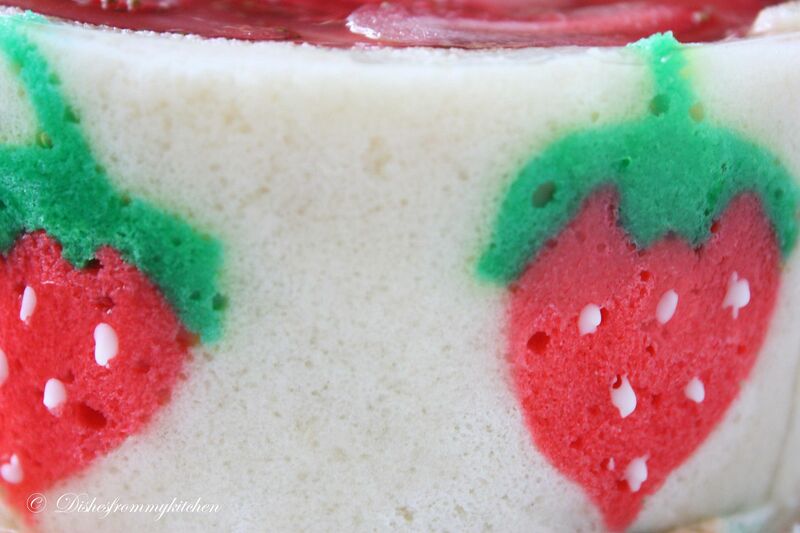 p.s do you tint the batter before or after spread a thin even layer of décor paste approximately 1/4 inch (5 millimeter) thick onto silicone baking mat with a spatula? 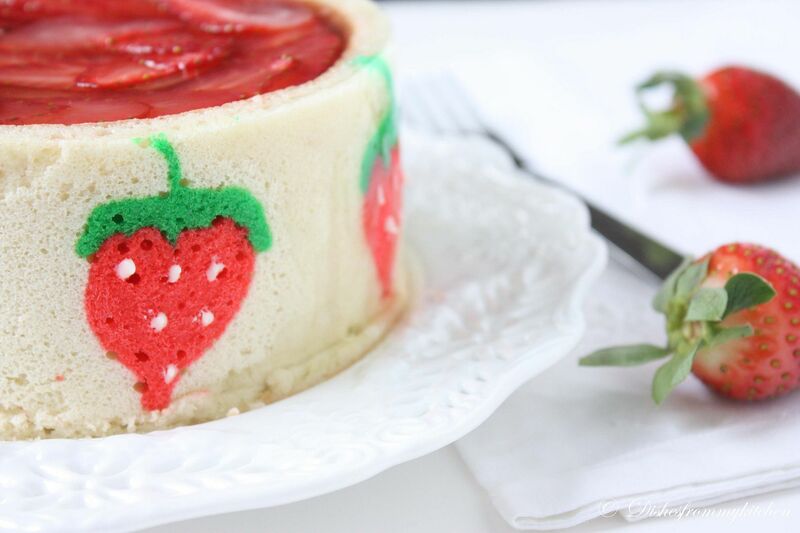 I did something similar before, but without Joconde batter atop, so I wonder the picture(one coco, the other is plain) on top just layered with decor paste or already with Joconde batter? And if it's topped with Joconde batter, is it still necessary to spread a layer of décor paste first? I love your strawberry design. Oh, so very pretty! 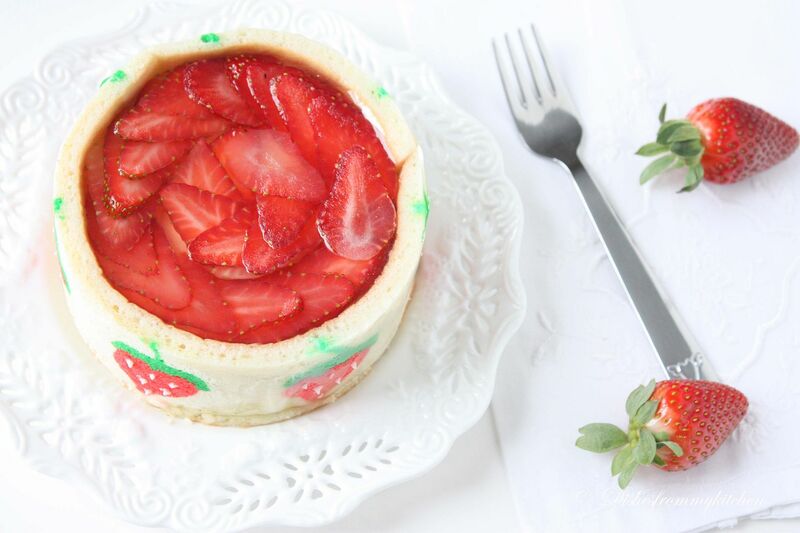 Your strawberry pattern is just lovely and I'm sure the entremet was delicious! Wow Wow Wow, I am out of words when I look at this professional picture as well as execution. This is Amazing! You Rock. The dish appears to be right in front of me, but I cannot eat it. Hats off to you. Wow Pavithra!!! 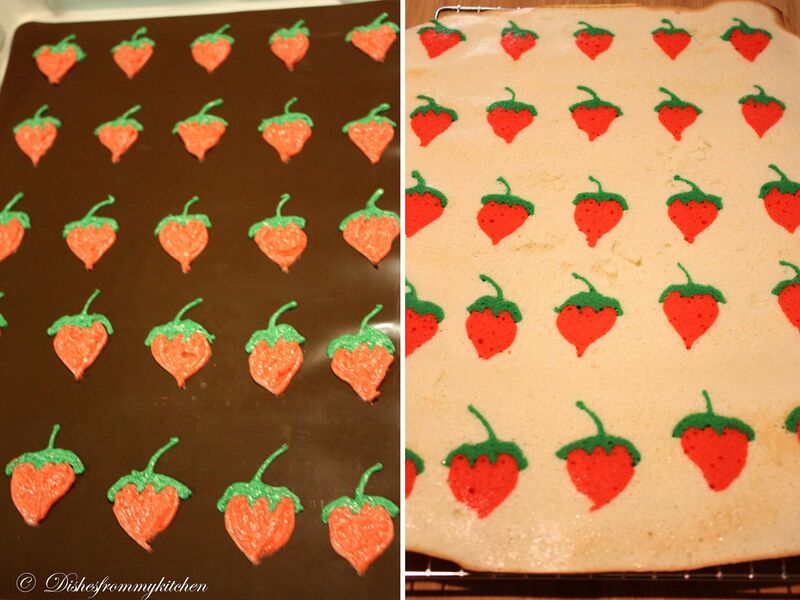 Loved those perfect strawberry patterns... great work dear!!! beautiful clicks! Looks delicious and mouth watering! Wonderful, it is really eye-pleasing. 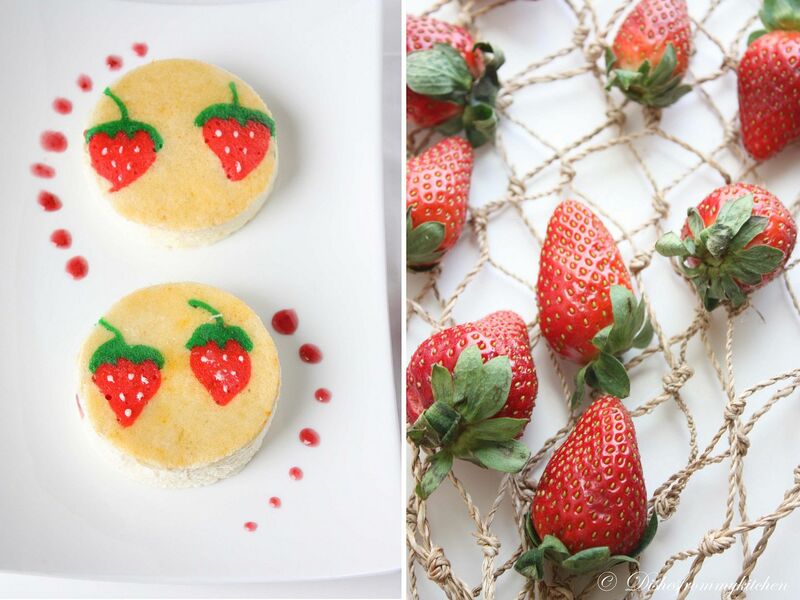 The strawberries look lovely. Wonderful! !Your pattern was so perfect, I just love it, great job. YOur entremet is so pretty. Love those perfect strawberries on the white background. They look like the real deal. Wow, so pretty! I love those cute patterns. Nice choice of filling. Great job. Pavitra, I didn't get your email. No worry...I saw this recipe was used by many other fellow bloggers, with the same description, but the results were all different. wow your blog is so informative and detailed! Gotta bookmark it! 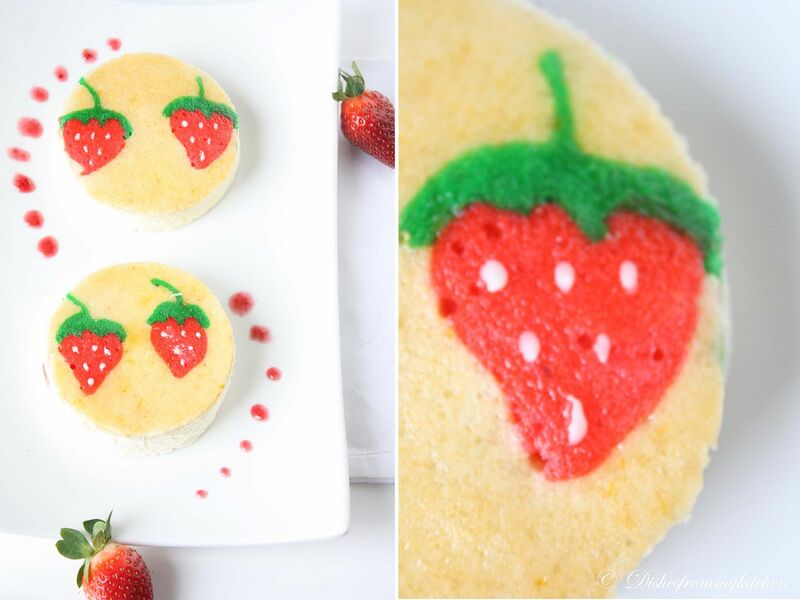 Your cake is so beautiful,i like your imprime, u can draw very pretty strawberries :D ! And I like how u stacked the strawberries on top..they're just so pretty!